Big News! YBC, Uncle Moishy, Ringling Bros at Barclays Center! I want to start off by saying that I really enjoy collections from all over the spectrum of Jewish music and HASC really gives us that from Haimish to Yeshivish and more. This year’s concert is even more greatly enhanced with the duets because you can pick up the qualities of a singer much more when he is paired up with another. 2-Gertner-Fried: An interesting choice of singers with their respective songs. It starts with Nissim – a Yossi Green classic that propelled Shloimie to stardom and followed by Ki Hirbaysa – a leibidike Slonimer niggun that became a hit about two years ago. Fried sang it on a single back then, but it is not a typical Avrohom Fried shtickel. This duet brings out the smooth elegant voice of Gertner while Fried is still Fried – one of the best. 3-Abie Rotenberg- Baruch Levine: It starts off with some emotional nostalgia with Abie and Baruch sharing their early experiences together in music in Toronto. ( I am also a proud Torontonian!) It got really cute when they played the famous Hamalach Hagoel sung by Baruch Levine as a child and Abie saying “your voice hasn’t changed a bit, heh?” They start of with Birchas Habayis – a B. Levine composition sung by Abie on Aish and the deeper Abie blends splendidly with Baruch’s high youthful pitch. They flow in to Habein Yakir Lee from Dveykus composed by Abie with Baruch doing the high Yossi Sonnenblick part – so warm and outstanding. They end off with “A Small Piece of Heaven” that Baruch alluded to in the beginning while telling his memories of Abie from a HASC video. 4-Shloimie Gertner – Lipa: They first sing Asay Asay from Shloimie’s 2nd album and again Shloimie is such a treat to listen to. Lipa entertains the oilom with his wit and humor and then inspires us with the background of his song Mizmor Lesoido, finally singing it together with Shloimie. 5-Yehuda Green – Ohad: Yehuda has his classic Carlebach emotional style complemented with Ohad’s fire. First they sing the first part of Hinei Yomim Boim then transition into Hashiveinu which is a deep classic that tugs at the heart strings. 7-Daniel Ahaviel – an amazing violin player plays “Hupp Kossack”. 8- YBC makes a surprise entrance with Eli Gerstner and sing Mizmor Shir-Aroimimcho Hashem. You can tell from the applause that the crowd was very excited to hear them. The solos are amazing! The song itself is quite leibedik, but not too jazzy. 9- Daniel Ahaviel again. I am amazed how he can play violin so well and at times seems like he’s playing two sounds at the same time. 10-Back to the duets with Ohad and Yonatan Sheinfeld who sing Yehi Rotzoin from Ohad’s new album. It’s a gorgeous hartzige song that just perfect for a duet. Yonatan is very impressive and reaches very high notes. He sounds so confident.Ohad is great and reaches notes most only dream of. 11-Then comes Duet “Made in Heaven”: Yehuda Green and Shlomo Carlebach z”l. They sing Am Yisrael Chai. It’s always emotional when we hear Carlebach, and now especially that he is in the Oilom Hoemes and hear a recording of him. Yehuda Green is a very appropriate duet with him since he is a “Talmid” of Reb Shlomo and sings in a very similar style. 12-Lipa and Zaidy Lipa: Lipa meets himself 30 years from now and they have an intriguing conversation about life in Yerushalayim with Moshiach preparing for HASC 52. They then sing a song “Moshiach” imagining the spiritual joy of those times and HASC is only a yearly affair celebrated by Klal Yisroel since everyone is healed. 13-Avraham Fried and Benny Friedman: The famous uncle and up and coming nephew start with Moriah and then transition in to Taamu from Benny. 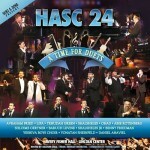 Avraham really shines in this medley considering he is the older one. I’m not taking anything away from Benny who was great, but Avraham is in a league of his own. For their last song, Avraham introduces Yossi Green’s Rifoeini and Benny asks his uncle permission to sing it. 14-Abie, Baruch Levine, Shalsheles and Shalsheles Junior medley: Haneshomo Loch from Baruch sung by Abie then Junior.Baruch takes over by the high part then harmonizes with Shalsheles. They transition in to the classic Eso Ainai from Shalsheles with the kids doing the famous Yosef Wartelsky low part and end off with Ato Echod. Yehuda Green – Nigun Moshe – sounds like a Carlebach. Ohad/Yonatan – Viairastich – A Yossi Green classic from Ohad’s original album. Baruch Levine – Ki hu ( with the HASC anthem in the background) – from Baruch’s 2nd album. It’s sung faster than regular. By “Mi Yaaleh” Ohad does some really high harmony and by “Neki Chapayim” they all get in to it. Abie – Neshomele with Avraham Fried doing the MBD part amazing! A HASC classic. Shalsheles and Shalsheles Junior – Mi Hoeesh – the hit first song from Shalsheles’s first album. It just occurred to me that if someone gets afraid of death from the Neshomele song, you get great advice on how to increase life from Mi Hoeesh! Avraham Fried – Make the world a kinder happier place. A great message that we should never throw in the towel! Then Fried shouts “Avrumi!” Maybe he meant Shloimie because next came Shloimie Gertner singing Happy Birthday that they all sing that tune to “Time for Music 24”. Yisroel Lamm ends off with the HASC anthem. On a side note I must say that the Gabai who gave out the “Kibudim” did a phenomonal job giving everyone their appropriate parts – a real symphony of Klal Yisroel where everyone really counts! Also, I realize that the singers did this L’sheim Shomayim and nobody used the stage to promote their new albums such as Ohad and Shalsheles Junior who had just come out or were just releasing their new albums. “Avrumi” is a young man from camp hasc who had come on stage (as hasc has done on many occasions). my personal favorite is the Ohad and Yonatan Shainfeld duet. Great review, thank you so much for taking the time to write this. sounds more like a report than a review. my favorite part is ohad and yonatan – by far! !